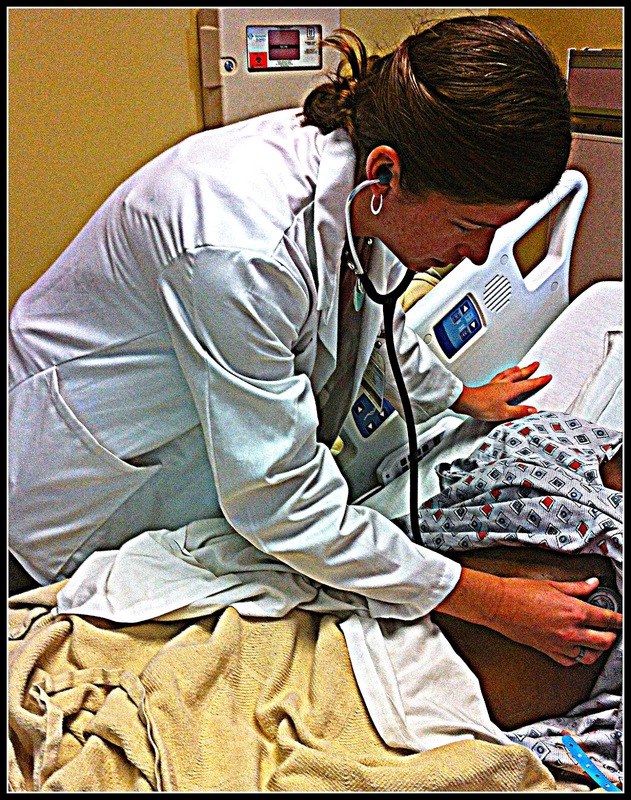 Reflections of a Grady Doctor: For Shanta Z.
P.S. Maureen really did hear those heart sounds. . . AND she came on her own time during summer break to round with me--because she wanted to. Labels: a poet and I didn't even know it, back to the bedside, bedside teaching, profesora, Shanta Z.
I get it from my mama. Ha ha! Thanks, Tounces! Your mama is right. Of course. I'll never forget my A&P teacher, Dr. Sparkman. Perfect name for her. I'll always remember when people in my nursing class would dispute a grade on a test with the words, "But I KNEW the answer," and she would say, "Yes, but in real life, knowing and not doing could kill a patient." Maybe that's why I'm not a practicing nurse. I'm too afraid of killing a person. Sister Moon, you are a born healer and a born teacher. And don't you think for a moment that we believe that you aren't still a nurse of sorts. Agree with above. The most dangerous health care provider is the one who won't admit what he/she doesn't know, see, hear, feel etc. If only more teachers were like you. In medicine, nursing, auto mechanics or whatever field you choose! That's so kind of you to say, Mary Alice. I appreciate you. My new favorite piece of your writing. Thank you. I am moved to improve my teaching, and create an environment where it's OK to say, "No, I actually don't know." "No, I actually don't hear that." "No, I actually don't see that." "Can you show me again?" I need to work on that. I will read this to remind me how important it is, and share it to help create that environment. Don't think you met Shanta Z. when she was at Emory, but teaching at the bedside today made me think of her. Her example as my friend and colleague inspired these words and I always hear her in my head day after day chanting her mantra "back to the bedside. . . back to the bedside. . .back to the bedside." Roger? Just keep doing what you do. It's working, my friend. P.S. Everyone: Roger is one of our chief residents and is an AMAZING teacher, physician and human being. Be encouraged that many of our up and coming colleagues get it. They do. I just spent the past week going through your (incredibly inspiring and moving) blog (well, a lot of it, at least), and I LOVE this post! I'm a third year med student, and I really work on asking questions, even the ones that feel stupid, because my future patients are gonna need me to have some answers. I'll try to remember this post of yours, some far off day in the future, when, G-d willing, I'll have med students of my own...Thanks for all the work you put into this blog, it's really touched my heart. Shosh, you will have medical students of your own. You certainly will. Today I ran into one of my former students from ten years ago. . .She is now an attending physician on the Infectious Disease service. The best part? When I overheard her teaching a medical student. Full circle. You are inspiring! I did medical school in Pittsburgh and remember Dr. Z taking us to the bedside regularly. I'm sure I would have loved to have had you teach me, as well. Your students will always remember you, I am certain! You are beyond fortunate to have had the opportunity to work with Dr. Z. She is the realest of real deals and personifies why it is so important to always go back to the bedside with our learners. I hope so fervently that some day I can be at least just a tiny little bit like you. You remind me each day how much I need and want to be more, to know more, to get it more... not just for me or for you but for all the mothers and fathers and brothers and sisters and daughters and sons who may need me some day. I hope Maureen realizes how very lucky she is to have the privilege to round with you on any summer day. Thank you, thank you, thank you! You are too kind. Thanks for these thoughtful words, WCD.